“We are most grateful to announce that President Donald Trump will address the 45th annual March for Life from The White House via satellite on Friday January 19th. Since his first day in office, President Trump has remained steadfast on his campaign promises to the pro-life cause and has actively worked to protect the unborn,” said Jeanne Mancini, President of March for Life. President Donald Trump will headline this year’s lineup of pro-life leaders speaking at the March for Life, including House Speaker Paul Ryan (R-WI), Pam Tebow, Matt and Adrianna Birk, Rep. Jaime Herrera Beutler (R-WA), Rep. Dan Lipinski (D-IL), Rep. Chris Smith (R-NJ), Bishop Vincent Matthews Jr., and Sister Bethany Madonna. Over one hundred thousand Americans are expected to travel from across the country to our nation’s capital for this year’s March for Life, a demonstration that stands against the greatest human rights violation of our time – abortion-on-demand. The theme of this year’s March for Life is “Love Saves Lives”, embodying the true spirit and mission of the pro-life movement by enlisting the power of love to empower others to choose life. 11:20 a.m. Musical Opening featuring Plumb! MFL urges marchers to use the Metro to arrive at the rally site. Recommend locations: Federal Triangle, Smithsonian, Metro Center. For metro info click this link. 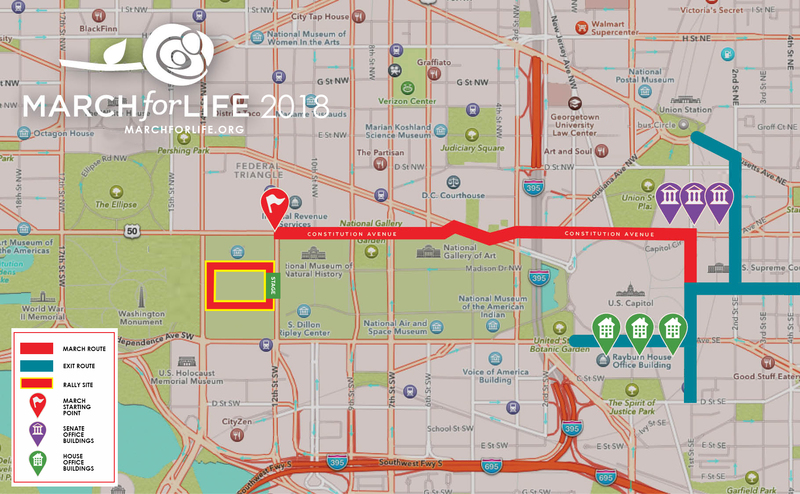 Check out the March for Life map — you can print off paper copies OR download the March for Life app through this link.